Overcooked! 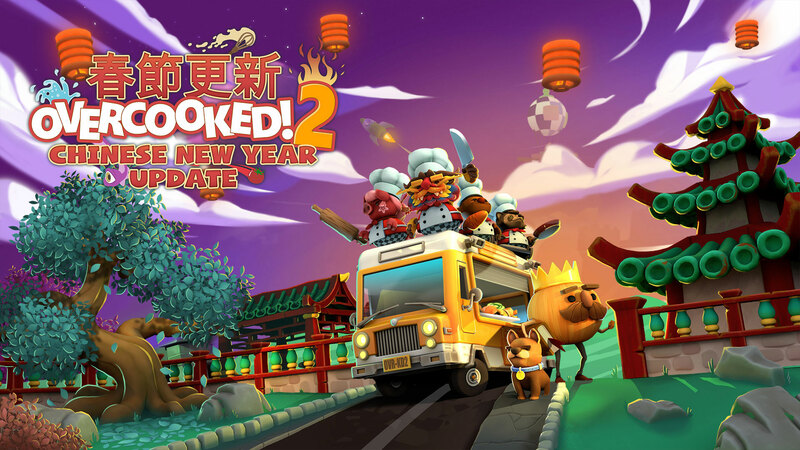 2: Chinese New Year – FREE update available now! We’re celebrating Chinese New Year in style with a free update for Overcooked! 2 which includes new kitchens, new recipes, new chefs, AND a whole new game mode! You’ll get to prepare two new mouth-watering recipes: fruit platter and hot pot! The delicious fruit platter is a traditional Chinese New Year dish that signifies fullness and wealth. While the hot pot is a dish to enjoy with family and friends. We’ve included two brand new chefs to represent you in the kitchen in this update. Get ready to turn up the heat with the fiery ornate Chinese dragon and celebrate 2019 as the Year of the Pig with our wonderful new pig chef! Also included in this update is ‘Survival Mode’, where every dish you serve will add seconds to the timer and you’ll be cooking against the clock to survive for as long as possible! Survival Mode is available for all kitchens of the main game, the Surf ‘n’ Turf DLC and both seasonal updates. And by popular demand, we’ve also added a ‘replay’ button on the results screen, so you can jump straight back into the same kitchen if you’re trying to beat your high score or just simply want to play again! Along with this content, we’ve done some bug squishing and issue fixing too! Check out the full list of changes below, for more information. New seasonal update content – available in the ‘Extras’ menu. New ‘Survival Mode’ – available to play from the World Map. Added an option to replay a kitchen from the results screen. Fixed an issue where the highlight might disappear after selecting an invite from various screens. Fixed an issue where plated recipes might not appear correctly following a player disconnecting in online games. Fixed an issue with the audio on the main menu not playing correctly. Various minor bug fixes and improvements. Official Livestream: We’ll be hosting an official launch day livestream and answering your questions in chat! Tune in today, at 5pm GMT on Twitch, Mixer, Facebook, YouTube and Steam! Steam Broadcasts: We’ve got special guests broadcasting their cooking chaos live on Steam. Tune in to the Overcooked! 2 Steam store page throughout the day to see how our guest chefs fare in the new kitchens! The free Chinese New Year update is available for Overcooked! 2 now on all platforms! Overcooked! 2 – Campfire Cook Off DLC & Season Pass Available Now! My Time At Portia – Out Now On Consoles! Yoku’s Island Express wins a BAFTA Games Award! My Time At Portia – Available to pre-order on consoles!